The nights are getting colder, which means it is time to start to pull up the garden. I have been meaning to get some pinenuts when I have been at the store…so when my sister-in-law called and asked me to split a large bag with her, I said yes immediately. I quickly went out to the garden and pulled up all of the basil. To Paul’s surprise, we had some lovely caterpillars who decided to hang on tight from the garden to the kitchen. The basil was taken back out to be sorted through. As I ran over to share some of my basil bounty and pick up my share of pinenuts, Paul sorted the basil and started it soaking. I let it soak for many hours, since I needed to make dinner and get the kids to bed. I rinsed the basil probably two times, and then put it in boiling water for less then 60 seconds. You don’t have to do this, but since I was unsure how clean I could get it and I want to freeze it for many uses this winter, I wanted to make sure it was really clean. 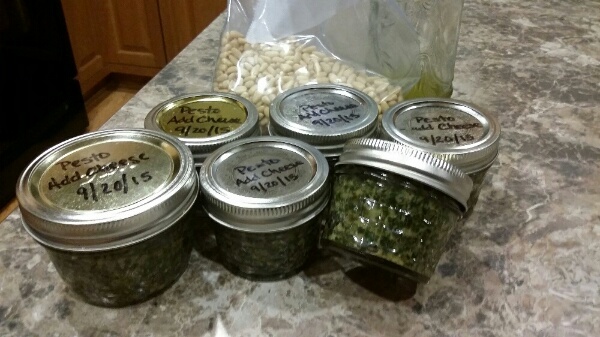 I ended up having 9 cups of packed basil. Here is the recipe I used…hopefully it will keep well in the freezer! Heat water in a stock pot to boiling. Throw in all of the leaves, and stir in. Let sit for 15 seconds and strain into a colindar with ice cubes. Run over with cold water to stop cooking. Toast pine nuts until golden brown. Make sure not to walk away from them as they burn quickly. Transfer into a food processor to cool. Use the same pan to toast the garlic cloves. Use a dry pan with the garlic cloves left in the peel. Toast and flip until golden – about 2 minutes. Peel garlic cloves and add to food processor. Add in olive oil, and basil to food processor and process until well blended. Leave it somewhat mealy and not completely pureed. Add in a little salt and taste. If you need more, you can add it but remember you will be adding in parmesan when you are ready to use and parmesan is pretty salty. Delicious, but salty. Spoon into jars to be stored in the refridgerator or freezer. Once pesto is packed into the jars, cover with a layer of olive oil to seal it into the jar and prevent spoiling. When you are ready to use, add in 2 tbsp parmesan per 1/4 cup pesto. You can add more of course.